Three esoteric reasons combined on April 11, to motivate me to go downtown. 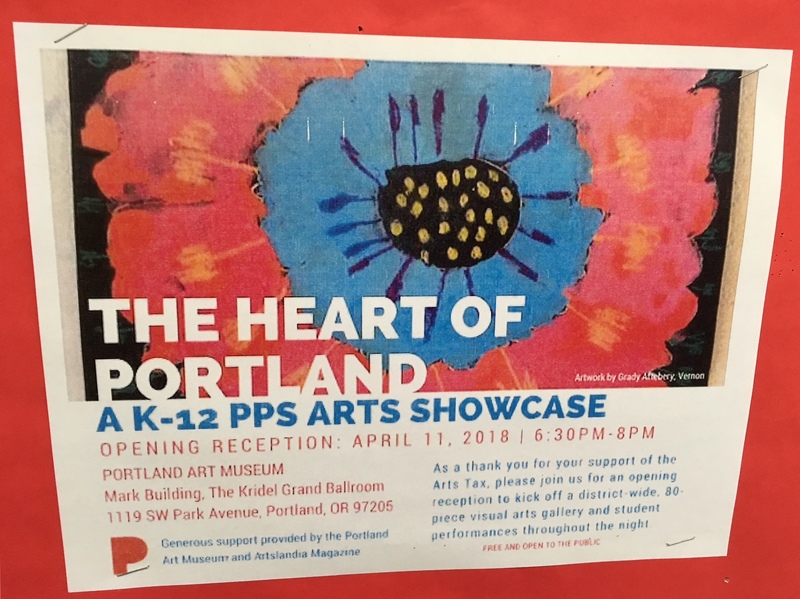 There was a Noise Review Board meeting, a PPS art celebration, that made me think I could score some grub to offset my Arts Tax, plus an afternoon protest over a shooting in a homeless shelter called Beds Not Bullets. The Orbit budget only covered a two and a half hour Trimet ticket. Time was tight. I started at City Hall expecting to run into protestors. If I could get through the crowds I would go to the Noise Review Board meeting then the Portland Art Museum. The tear gas and protestors had dissipated. I saw no evidence of a protest. I approached City Hall like I owned the place to find the doors locked. 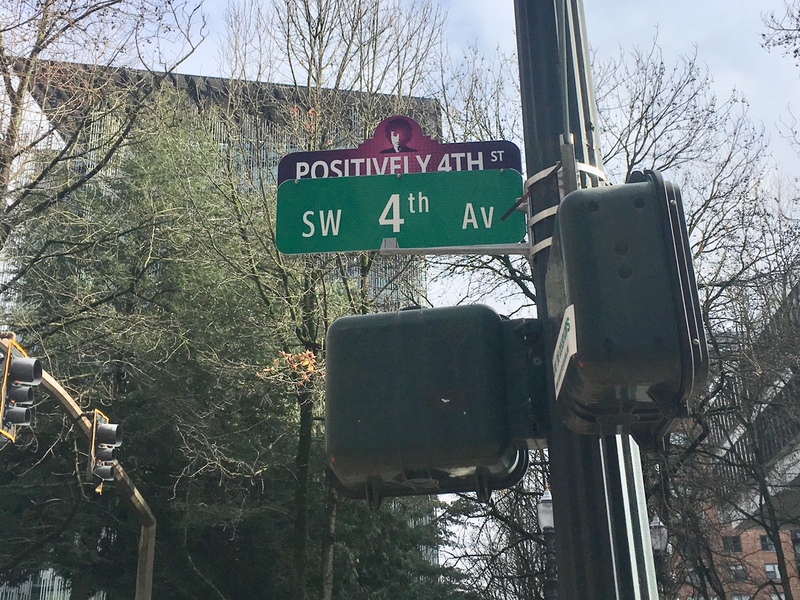 Discovering I was at the employee entrance I stood around until I noticed a sign directing me to the doors on SW 4th Avenue. There were no protesters around this side of City Hall. The early bird protest had me a bit dumbfounded. I headed into City Hall catching up with two neighbors who were part of my neighborhood association. I sensed the solidarity but being a fair weather meeting attendee I didn’t get a chance to explain why I wouldn’t be there long. Entering City Hall was not as bad as expected. There was a pat down with a magic wand/metal detector but I didn’t have to remove my shoes or empty my pockets. Then we set off to find the Pettygrove Room. The quarters were cramped but it’s hard to imagine most meetings being standing room only like this one. The Noise Review Board in action. My interest in the meeting involved the sole agenda item concerning noise levels at the Portland International Raceway. I live near the track. For the most part it’s a live and let live kind of thing. The sounds don’t bother me. Race fans have that need for speed and the voice calling races through the P.A. system creates a feeling of an unknown nostalgia for me when I hear it at our garden plot. At this meeting representatives of an upcoming race were asking for a variance for noise levels. As explained on the City of Portland website, a variance is “for activities that make more noise than our Noise Code allows.” I had recently downloaded a decibel app on my phone which came with a handy chart. My curiosity piqued when I saw that the 115 decibel levels they were asking for are comparable to a rock concert. Beyond that I wanted to know who attends Noise Review Board meetings and see the board members. I imagined them wearing industrial headphones for some reason. None of them did. Other answers I sought related to finding out would happen if noise levels were exceeded and how the sound was measured. I caught the opening remarks of David Sweeney, representing the race promotions company and heard him talk about how excited people would be to have Indy car racing back in Portland and the boost the race would offer the local economy. He discussed how the noise levels would be controlled. Cars exceeding the levels would be taken off the track for adjustments. He explained that test days helped determine the types of tires that would be used in the races. In the too small meeting room I detected an odor of cologne and Subway sandwiches eaten prior to the meeting. I noticed a photo exhibit in the room, shots of protestors, that were engaging images to mix into the proceedings. Deliberations might have been interesting along with a mix of different perspectives from the testimony but my time with the Noise Review Board was brief. These were a matter of fact bunch, who took on all variations of noise, the majority dealing with construction or race track. 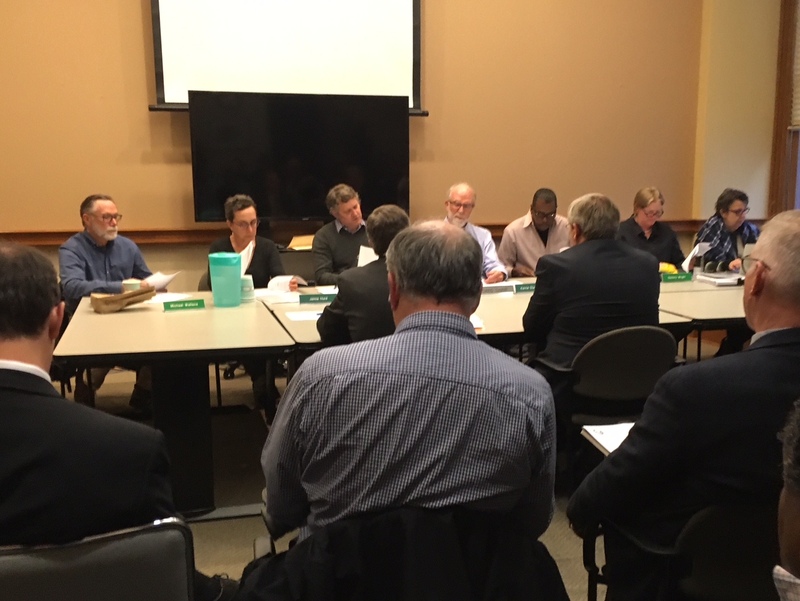 The board chairman mentioned people offering oft-repeated testimony could say something like, “it’s already been said,” to speed the meeting along. There was something about the formality that made me nervous. I had been there almost a half an hour and had already eyed the door knob and mentally rehearsed how I would make my exit. The sign on the door said pull but I reminded myself that I would need to pull the handle down first then open the door. Leaving the building, I remembered I wanted to ask the security guard about the protest but I had already gone through the turnstile. The guard was across the lobby talking to a coworker with his back turned. It was time to shift from politics to art. 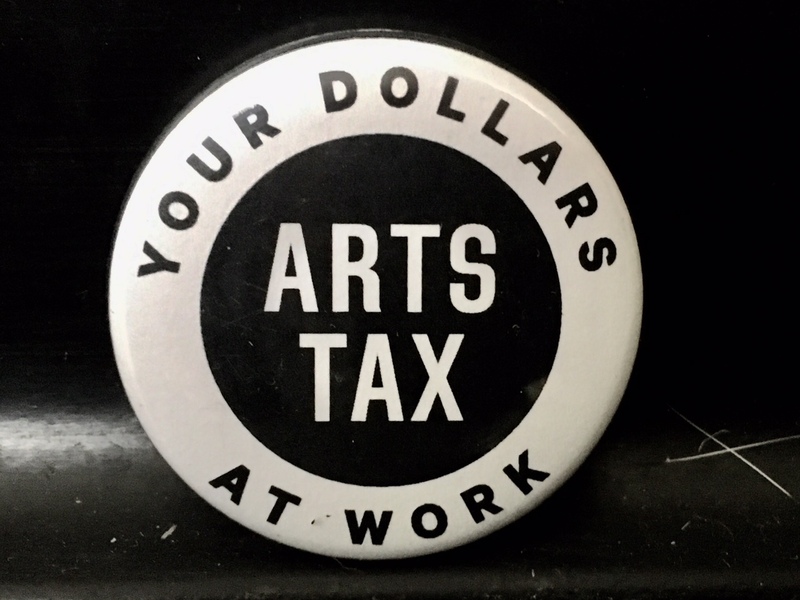 Since the inception of the Arts Tax, it seemed like a burden to fork over additional money at income tax time. I learned from a crawl on the Channel 12 news that 92 art and music teachers in kindergarten through 5th grade schools were employed with the help of the tax. Working in an elementary school, it would be hard to imagine students without a music or art teacher. I’ve been slowly making my peace with the tax but the 70 bucks I pay for our household takes an annoying bite from our meager budget. This was the first I had heard of any events related to the Arts Tax so I had to check it out. Arriving at the event space at the Portland Art Museum, I was surprised. The place was packed. Not expecting mobs of art enthusiasts, I weaved through the crowd as the school system Superintendent spoke in the museum’s third floor ball room. He sounded official, enthusiastic and supportive. I was inspired but not sure what to do about it. A video showing drama students going to Seattle to see Hamilton followed. Then more Hamilton. A student stood on a separate stage busting out a Hamilton-style Paul Revere rap. It was as educational as it was engaging but I was in Hamilton overload. Where was the food? This crowd, there were too many people to feed. Heading over to a side wall I spotted the spread on a small table with items covered in cellophane. There was not enough food to feed me much less the massive gathering. Once the food was ready I restrained myself. It wasn’t going to be fair to hog humus. I chewed and stewed then realized I needed to see the art–the fruit of the Arts Tax. The Grant High School Jazz band began. They were hopping. They played me off as I exited for art. 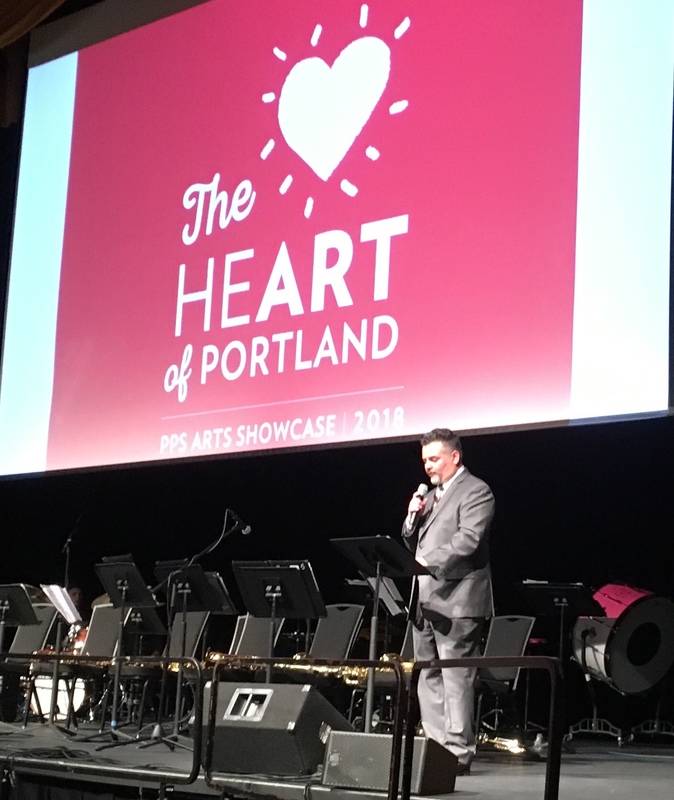 The ballroom crowd reminded me of how supportive people are for the arts in Portland. Having come from the Noise Review Board, I was also reminded that issues get people engaged in civic meetings too. I found the art on the first floor where it occurred to me that these young artists had ideas. There was a piece from each school with an art program. I ran into the art teacher from my school along with the artist and her family. I put the teacher on the spot by asking her if it was hard to choose a piece of art to represent the school. She emphasized the challenge of picking one creation from the work of all the students. 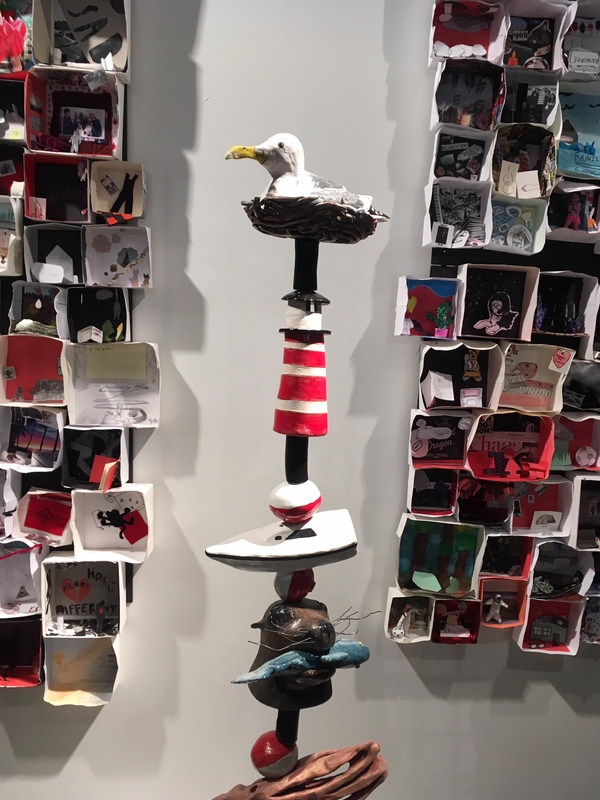 The selected art work was neat and organized–a challenge when you’re creating your work in an hour of class time. It stood out from the other work displayed at the school. After a few minutes of trying to capture the image of a seagull sculpture I dashed off to catch the train before my ticket expired. I arrived home with minutes to spare. After a bit of reflection, I reached two less than serious conclusions about that evening’s events. 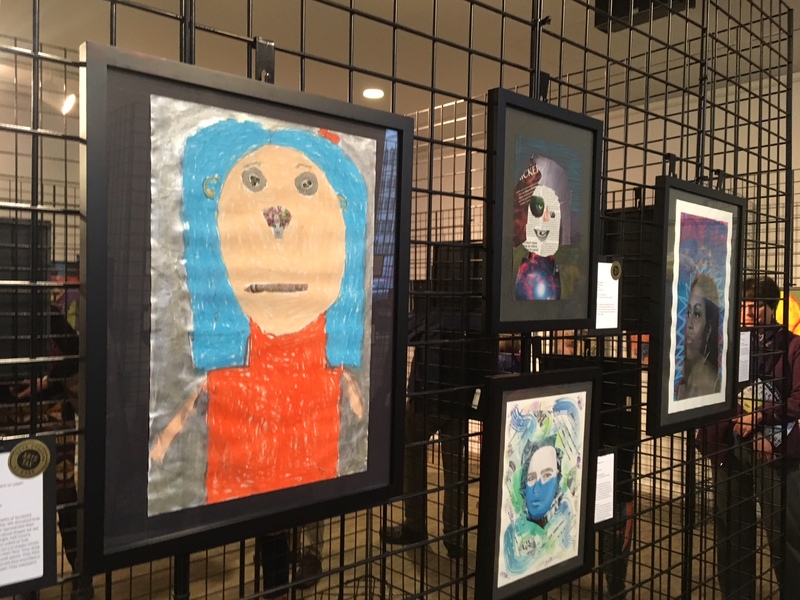 I doubted that the noise from the race track would ever bother me more than the noise in my own head and I realized that the Arts Tax is a necessary evil especially when it teaches kids about art and how to make it. This won’t stop me from complaining about it. Life will go on and next year I’ll grumble again about making the payment. 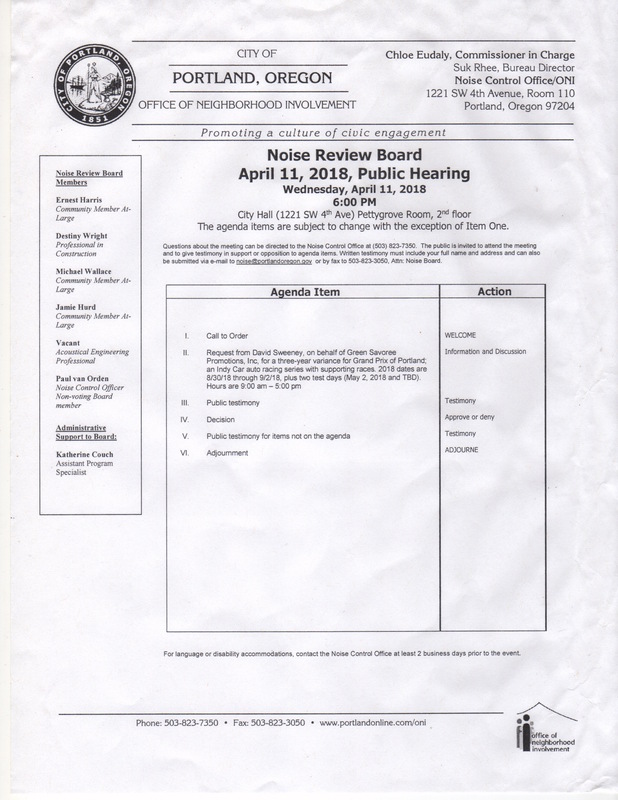 Post Script: For anyone wondering about the variance from the April 11, Noise Review Board meeting, I can report that it was approved. I would point you to the hearing’s minutes but they won’t be posted until the Board approves them at their next meeting. Evelyn Collins: Portland’s Mrs. Doubtfire?